So the theme of my party is Blacklight/Dance/Gangsta. This is an end of the year party, not a birthday! Since I'm going into high school next year, I've invited EVERY eighth grader in Temecula, just about. I'm going to every middle school and giving out flyers basically promoting this event. The point is basically to get people to make friends with other kids going to their high school next year. Since I'm going to a high school that LITERALLY nobody in my school is going to, this is a MUST for me! Invitations: To make the invitations, I went on publisher and made a cool flyer On plain white paper. I made the text boxes black, and the font for each section is in a different neon color. I also added a funky pic of neon colored fog. On the back of each each flyer, I told everyone to wear white. I also included a little note to parents saying that there WILL be a chaperone and gave them my mom's info! Activities: Of course no dance party is complete without music! So my sister's almost-boyfriend is a DJ and might come and DJ for FREE! Yay. When people first walk in the door, they'll be given a paper wrist band, there are three differsnt colors, depending on which high school they're going to. About half way through the party I'll have everyone write their names names and phone numbers on one of three posters, once again corresponding with the high school they're going to. This is mostly for getting to know even more people going to their high school and of course make friends with people going to other schools, too! Games: Well it's mostly a dance party, but there are always the people who don't dance or get tired from dancing. For them, I'll have out Twister, various board games and of course KAREOKE! :) As for the party animala, we aren't JUST going to dance. There's going to be a dance-off for pairs and for singles, but not for the best dancers, for the best seventies dancers, the craziest dancer, and the dancers with the best moves! Ei: the worm, etc. Prizes will include various glow-in-the-dark items, feathered boas, and neon gangster hats otherwise reserved for my five VIP, of course the chaperones and myself. Costumes: Everyone will be told to wear white, since it IS a blacklight party. Everyone will also be given a glow necklace and bracelet. Otherwise, my VIP will be dressed in bright neon clothes with the neon gangster hats and I'll dress in a neon mafia princess" costume. The chaperones will wear shirts that say "crowd control" in glow ink and wear the neon gangster hats! Party Snacks: We're making LOTS of finger foods before the party. Plenty of water will be on hand we're making a lot of wild (virgin) drinks with it! 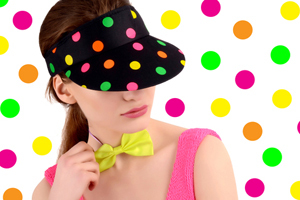 Favors: Aside from the glow necklaces and prizes won in the dance-off everyone will be given a neon bandana a bead necklace with a large crown charm a bead necklace with a gold dollar sign a neon squirt gun and metallic sunglasses with extra dark lenses.